Nowadays who don't have an android smartphone ! 90% of the android phone users like to browse any website in application not in browser ! So do you also want a professional android app for your website ? If yes then you are in the right place. I will convert your RESPONSIVE website into a professional android app. If you want to convert some webpages into app then I can also do that for you. When user will press back button app will take them to previous page (if they will have any, otherwise it will exit). Spalash Screen ($4.00) : When user will open the app they will get a screen before loading your website. You can put anything in this screen like logo, texts, slogan etc. 3 Dot Menu ($4.00) : 3 Dot Menu will be placed at the top of app action bar with share and refresh option. Back, Home, Forward Button ($4.00) : 3 Icon/Image button will be added at the top action bar. User can go back/forward or can go to home page by using these buttons. Progress Bar ($4.00) : Sometime your website may take some time to load and for showing the loading progress in top. I will add a progress bar which will show loading progress. 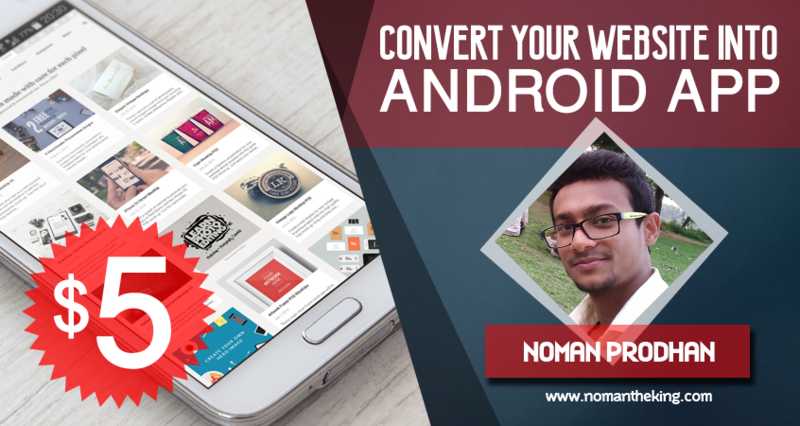 Convert Your Website Into An Android App is ranked 5 out of 5. Based on 2 user reviews.